"THE LAND BEFORE CRIME" CONCLUDES! • Eddie Brock and the Venom symbiote are having a tough time sticking together, biologically speaking. Fortunately, the fine folks at ALCHEMAX are working on a cure! • Eddie just has to find and stop Stegron the Dinosaur Man from turning New York into a raging army of dinosaurs for them! 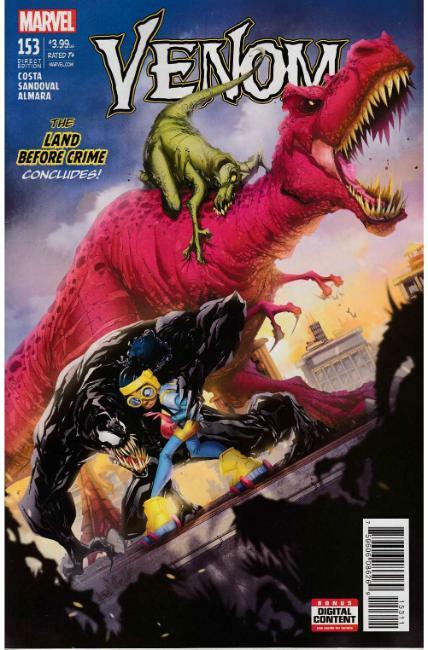 • Luckily, MOON GIRL AND DEVIL DINOSAUR are around to help! I wonder if they realize Stegron can control dinosaurs in addition to turning people into them.